Entrainment is a principle of physics. It is defined as the synchronization of two or more rhythmic cycles. The principles of entrainment appear in chemistry, neurology, biology, pharmacology, medicine and more. While working on the design of the pendulum clock in 1656, Dutch scientist Christian Huygens found that if he placed two unsynchronized clocks side by side on a wall, they would slowly synchronize to each other. In fact, the synchronization was so precise not even mechanical intervention could calibrate them more accurately. More recently, audio entrainment gained recognition and awareness through Mozart’s classical music. The concept of the “Mozart effect” was described by French researcher, Dr. Alfred A. Tomatis, in his 1991 book – “Pourquoi Mozart?” (Why Mozart?). He used the music of Mozart in his efforts to “retrain” the ear, and believed that listening to the music presented at differing frequencies helped the ear, and promoted healing and the development of the brain. So how does entrainment apply to our brains? What do we mean by ‘brainwaves’? ‘Brainwaves’ are produced as the billions of neurons in our brains transmit action potentials down their axons to the synapses where they trigger the release of neurotransmitters. These action potentials are essentially electrical charges that are passed from neuron to neuron. By placing sensors on the scalp through the use of electroencephalograph technology (an EEG machine), researchers can detect not the individual firings of neurons—they are far too small and numerous to differentiate—but the sum total of this electrical activity, dubbed ‘brainwaves’ for their cyclical nature as shown in the diagram above. Do we get the most out of our brainwaves? One of the problems with modern society is that we tend to ‘drive’ our minds in such a way that our brainwaves remain in the Beta level seen in the diagram above. We live in a continually stressed out state of what we refer to as “Beta frazzle”. Most people tend to rush around, think too much, multi-task and frequently overload their minds with stressful thoughts. At the other end of the spectrum, some people hardly use their minds or challenge themselves at all. 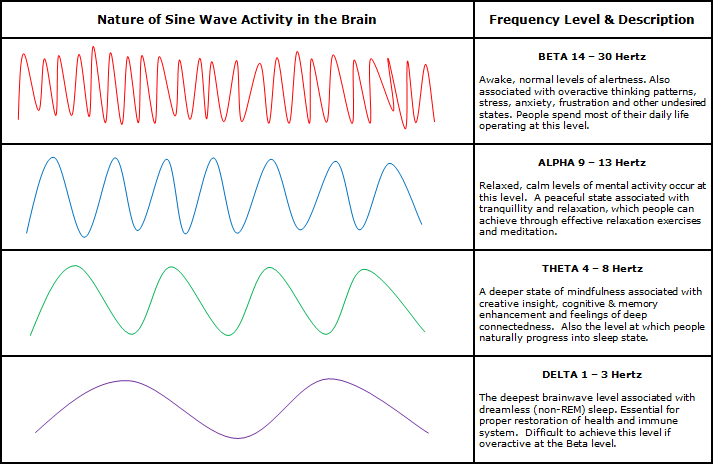 Unfortunately most people have very little natural control over their dominant brainwave state and hence can’t easily access the significant benefits provided by the other brainwave levels seen in the diagram above (Alpha, Theta or Delta). 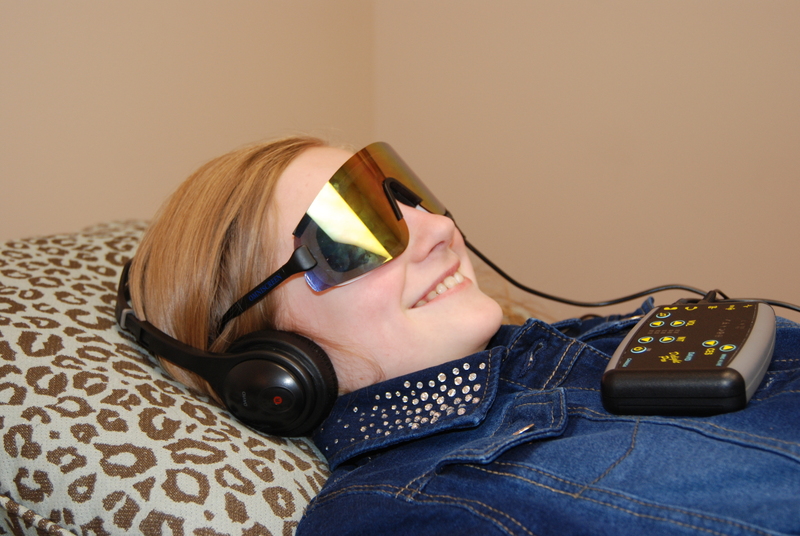 Properly engineered brainwave technology, however, can influence your brainwaves by providing an audio stimulus that, so long as the necessary conditions are met, can guide your dominant brainwave state to the desired frequency. 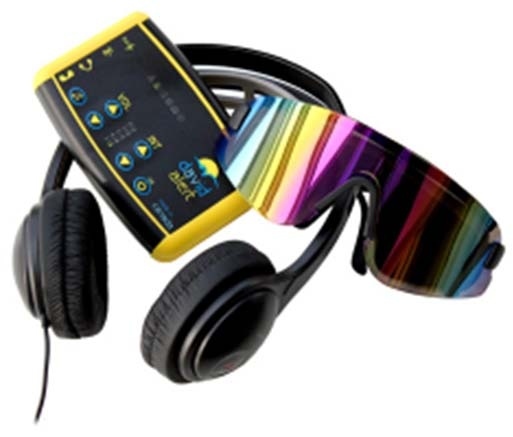 This is significant, as the combination of the right audio technology and a set of headphones can provide an access point to positively influence your cognitive function and achieve beneficial states such as deep relaxation, enhanced memory and mental performance or increased energy, focus and motivation. As an example, the Neural Agility recording on our RevitaMind product has been designed to entrain your natural brainwave patterns down to a specific frequency within the Theta range known to support improved memory, mental sharpness and processing speed.